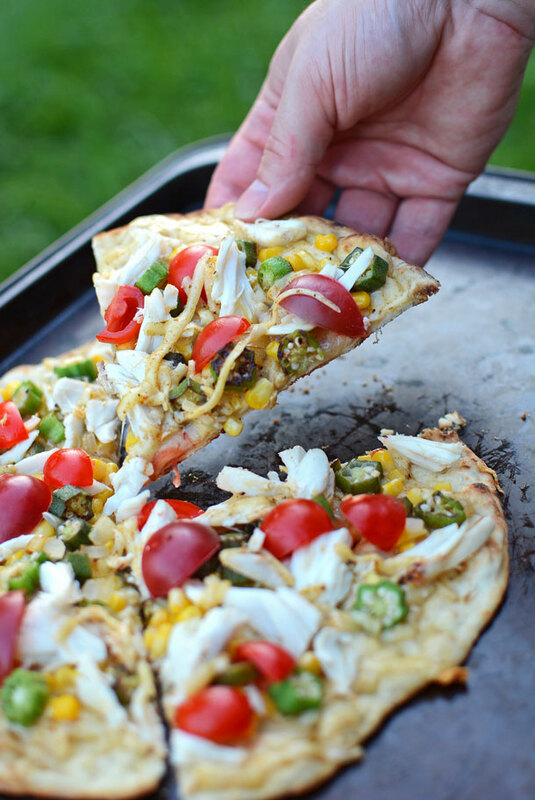 Crab, Okra, and Gouda Flatbread – With cooler weather approaching, we’re taking one last moment to dream of the beach with the flavors of crab meat and Old Bay on this delicious flatbread! One adventure that was a family favorite was a day trip to Assateague Island, a little barrier island off the coast of Maryland and Virginia. The Maryland half houses Assateague Island State Park where I recently visited with my family. The Virginia half, which neighbors the small island of Chincoteague, is referred to as Chincoteague National Wildlife Refuge. The two island halves are simply separated by a fence. As a national park, much of it’s beauty is preserved. In fact, I went on a Girl Scout camping trip there in elementary school and very little has changed except that the island is constantly moving and changing shape with the tides. The thing that makes Assateague particularly unique is it’s varied wildlife, including it’s famed wild horses. Actually, if you’re a horse person, their stature would technically classify them as ponies, but their genetic makeup is of that of a horse. It’s thought that the briney island environment has affected their growth. Whatever they may technically be, they are affectionately called Assateague horses in Maryland and Chincoteague ponies in Virginia. There’s further debate on how the horses ended up on this little island. Some believe that they were brought to the island by settlers, and a more exciting story is that they are survivors of a Spanish galleon which shipwrecked off the island many years ago. In addition to horse spotting and enjoying Assateague’s beautiful beach, we went bayside to Old Ferry Landing where people can participate in the wild sports of clamming and crabbing. We didn’t come prepared for crabbing this year, but there were some gracious crabbers that let my son give it a go, and he was delighted to watch a Maryland blue crab scuttle across the dock. We caught and released, but when I think of OC Maryland beach food, buckets of crabs are the first thing that come to mind. 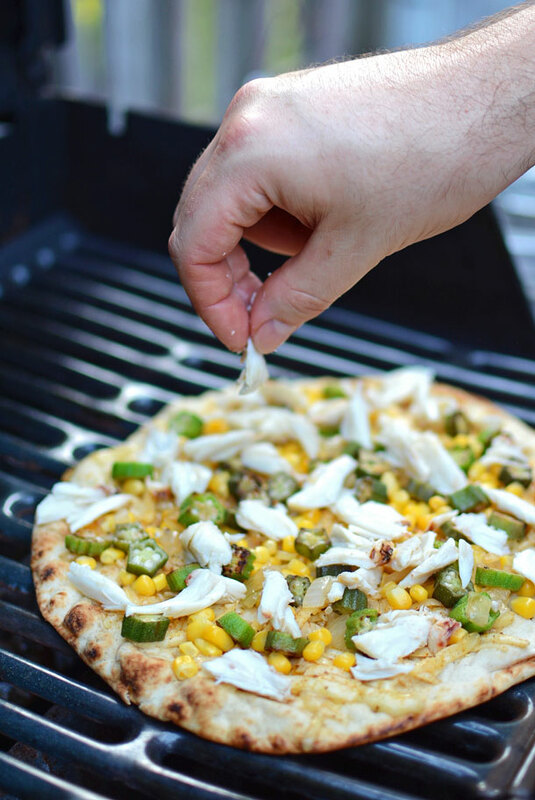 Before beginning our vacation this year, my husband and I grilled up these Crab, Okra, and Gouda Flatbreads. 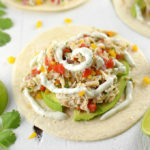 I wasn’t able to get my hands on any Maryland blue crab in the Philadelphia area, but they were pretty darn good with refrigerated tins of super lump crabmeat. If you can get your hands on fresh crab, you’re a lucky duck! For these flatbreads I used all local veg that can be found in September. That said, although it’s reminiscent of summer, it’s really a September dish. The red wax gouda adds a richness and butteriness to the dish and gets on so well with the crab and corn. The tomato ties the dish together with a touch of sweet acidity, topped by the pop of fresh okra. 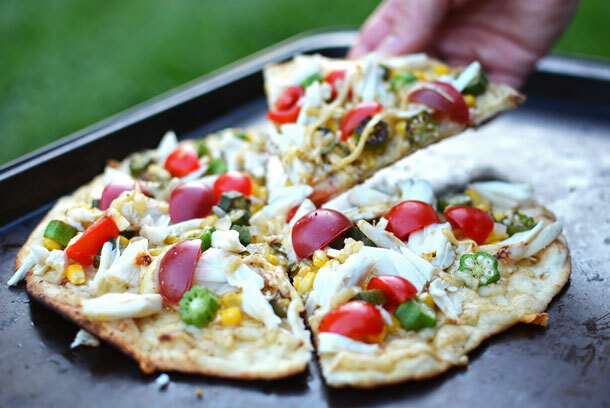 With cooler weather approaching, we're taking one last moment to dream of the beach with the flavors of crab meat and Old Bay on this delicious flatbread! 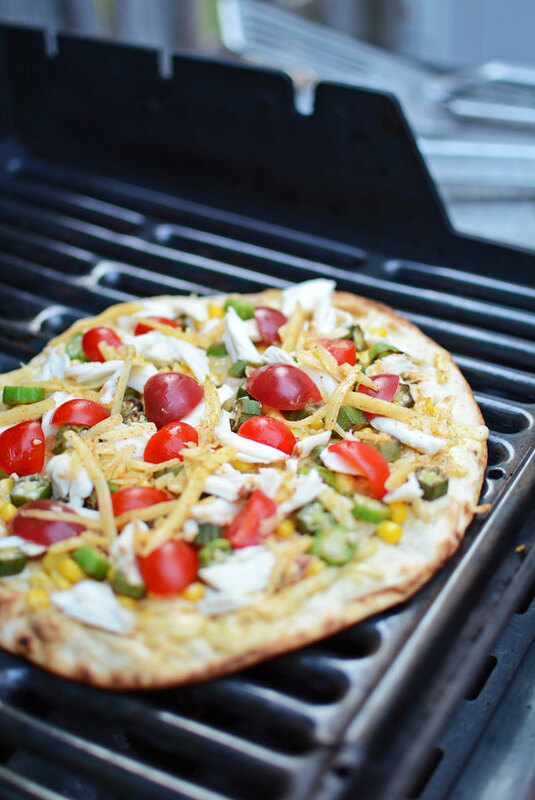 Preheat and clean your grill, and while the grill is heating prep all of your ingredients. 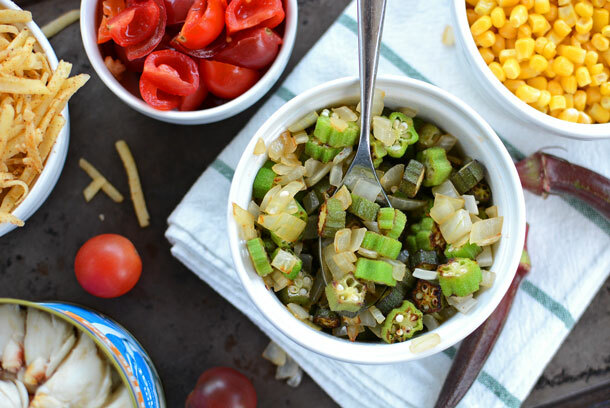 Combine ½ tsp olive oil, 1 cup of okra cut into coins, and ½ cup of diced sweet yellow onions in a sauté pan over medium high heat. Sauté until the okra and onions are softened and browned. Remove from the heat and set aside. Prep the gouda by shredding it and then evenly coating it with Old Bay seasoning. Quarter and seed 1 cup of cherry tomatoes. If you're using fresh corn, remove it from the husk, and if it's frozen, thaw it out. Once the grill is heated and cleaned set the grill to medium-low heat and brush olive oil onto one side of the lavash bread. Place the bread oiled side down on the grill. 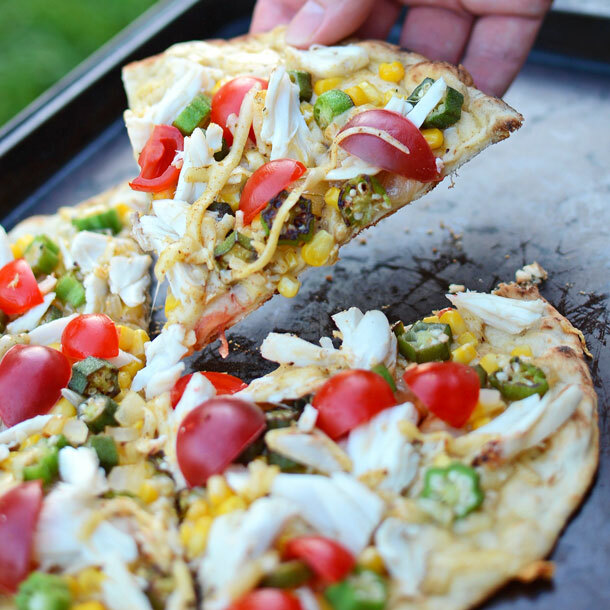 Quickly assemble by sprinkling with gouda, corn, okra and onion mixture, crab, and then cherry tomatoes. Shut the lid and grill 5-7 minutes. It is finished once the cheese is melted and the lavash is beginning to brown. 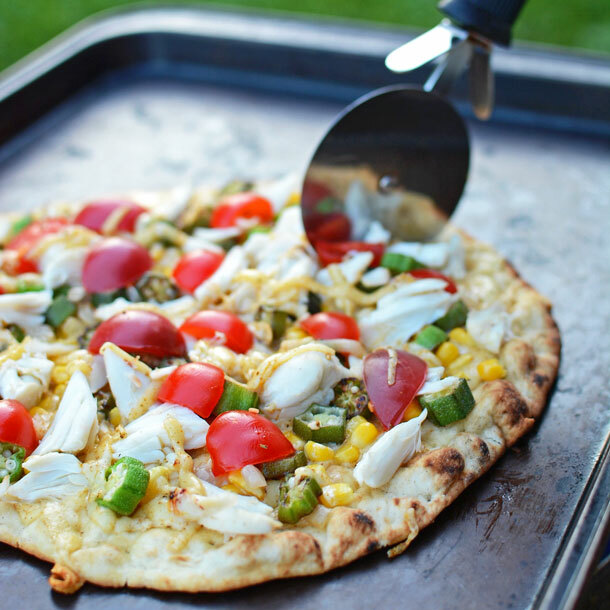 Allow the flatbread to cool for a couple of minutes and then serve as an appetizer or an entree. I love the fresh look of this and the combination of flavors. 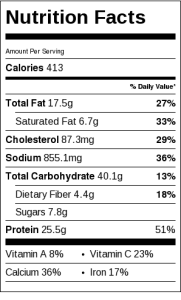 What an unusual combination of ingredients. I think I’ll be giving this a try. If you give it a go, let me know how it turns out! Interesting combo of things on this one! I love the grilled flatbread and the photography is very well done! lol… my husband was a little skeptical when I first suggested the recipes, but I think he agrees that it was AWESOME! You always come up with the best food combos! 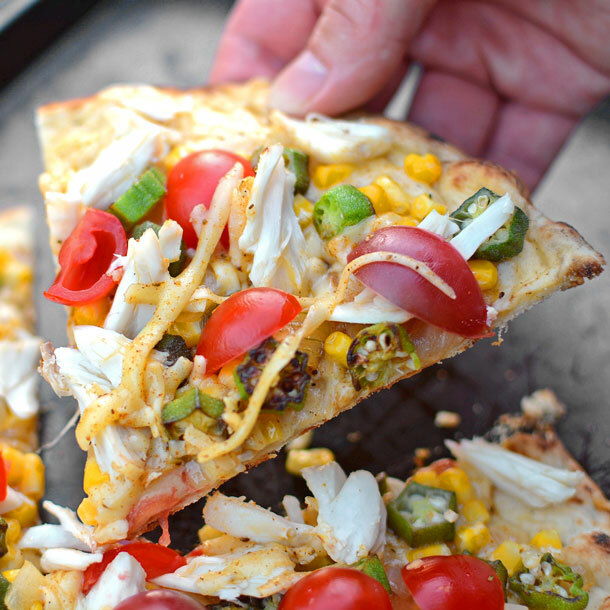 Crab and gouda on a flat bread? Yes ,please! 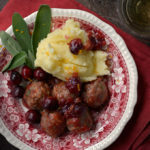 This is a great combination of flavors, texture, and color; I also love that you grilled this! Thanks so much for sharing. i would have never guessed to add okra and crab together but looks pretty delightful. Looks delicious! Thanks for sharing at Small Victories Sunday Linkup! No problem. 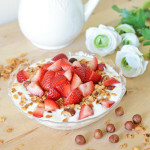 You have a lot of delicious recipes and awesome looking ideas on your linkup! 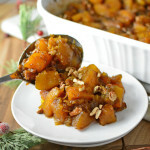 I was experimenting with this one, and it ended up being delicious! Admittedly I ate a whole flatbread by myself. What a unique flatbread combo! I bet this tastes amazing! Oh my goodness I would love to have a piece of this right now! Haha! I wish I could share. The darn computer screen gets in the way. Your holiday sounds wonderful. Here is getting colder every day, so beach and sun and warmth stories kind of break my heart right now…. Especially since I haven’t even seen the sea this year…. The flatbreads look great, but to get crab meat here, especially fresh, would be some kind of miracle. Okra as well. But I bet it tastes amazing! I’m so sorry you didn’t get some beach time in this season! Where I live I’m fortunate enough to be in a growing zone that for a brief part of the year allows warmer climate items like okra, peppers and tomatoes to flourish. I certainly don’t take that for granted! This looks so wonderful. Glad to connect with you, and thanks for linking up. I love okra and so does my son. I want to try this. Thanks Leigh! 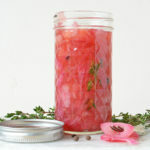 You’ve got a lot of great ideas and creative blogger on your link-up! Those colors so pretty ! 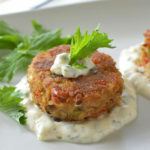 And what a fabulous way to incorporate okra in our lives ! I’m in ! Thanks Florentina! I’m just crazy about okra when it’s cooked in a non-slimy way! This looks like a fun combination. Such a creative way to use okra. I am always confused what do to with it when I make myself buy it. 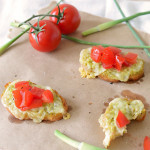 Now I know, this flat bread is on the dinner list! Okra is a challenge because of the slime factor. I found cooking it fast on high heat is the best way to go. 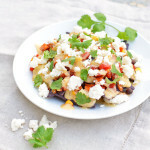 For another idea you might also like my Corn and Okra Maque Choux. big okra fan here! But, i have never thought of putting it in a pizza..yum! Okra’s that best when it’s done right! What a marvelous combination. This would be perfect as appetizers. Thank you for sharing. Thanks Marisa! I was torn wether to categorize this as and appetizer or an entree. We ate it for dinner, but it would also be awesome to serve to some friends during a cookout! Lol! I can see how your kid-self would not be a huge fan of okra. 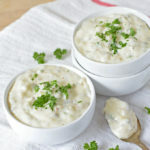 I promise that it’s not slimy in this recipe! Probably a safer way to be introduced to the vegetable. So summery…all the flavors, spot on!